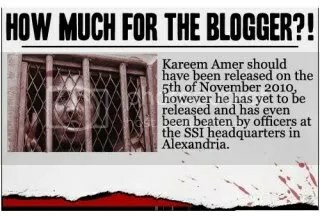 Egyptian blogger Kareem Amer finished his unjust sentence on November 5. Instead of being released the SSI, the Egyptian secret police, essentially kidnapped him and have been holding him illegally and beating him constantly for over a week. Kareem has already served four years for thinking critically about religion and politics on his blog. The authorities cannot hold him legally any more so it looks like they are trying to kill him outright. Help get Kareem freed before it’s too late. We have begun a Facebook-based campaign, How Much for the Blogger? The reason we’ve chosen Facebook is because of its immense popularity, especially within Egypt. It is also immediately accessible. We encourage you to write to Egyptian officials and ambassadors in your country too, but the Facebook program is crucial. See below the fold for the entire statement and more links and instructions. Help us ransom Kareem Amer. He’s been kidnapped by State Security and his life is in real danger. Become a Negotiator and join the Facebook Ransom Campaign immediately. Help us save his life! Kareem Amer served four years in prison for his writing on the Internet. He was due to be released from Borg Al-Arab Prison in Alexandria on Friday 5 November. Instead, he was taken to the Alexandria headquarters of State Security Intelligence, where he is being held illegally and beaten. Regardless of the justice of Mr. Suleiman’s original sentence, he has already served his time in prison! We’re asking the Egyptian government and the SSI officials to immediately release Kareem, as his continued imprisonment is clearly illegal. It is, in fact, kidnapping. The problem is, we have yet to receive a ransom note from his kidnappers! What do they want? Is it money? What are their terms? In order to inspire the men of Egypt’s State Security Intelligence to tell us why they are keeping Kareem in defiance of the law, we are going on Facebook to respectfully request they send us the ransom note. Please help us by becoming a Negotiator on this Facebook Ransom Campaign for Kareem. Here’s all you have to do. Change your Facebook profile picture to the official How Much for the Blogger? banner. Repost the latest HMFTB blog post on your personal website, blog, or Facebook; or link to it from any other social networking website. This may seem obvious, but a good negotiator does not give away personal details. Join the Facebook page for Egypt’s ruling National Democratic Party. That way, all of the comments you make regarding Kareem’s freedom will show up on the NDP’s stream. Join our Facebook page, and follow us on Twitter to receive the latest news and updates about the ransom deal!